The children’s bedroom is so much more than a place to sleep, it’s a place for children to be inspired, establish their own identity, play, study and dream. When creating the perfect bedroom for a child, the design should take into consideration the child’s personal preferences, available space, and be adaptable as the child grows. The overall look should be in keeping with the style of the home to create harmony throughout. Careful planning ahead ensures that one achieves the desired effect, such as a modern, cool, enchanting environment, or a bold eclectic statement to capture the imagination. Knowing where to begin can be the hardest part of designing the children’s perfect bedroom. homify offer exciting hints and children’s bedroom ideas on the website. The modern child’s bedroom is stylish while retaining a fun, light heartedness. Easy to adapt, it is designed to have an overall timelessness. Features, such as children’s curtains, pictures, and lighting, can be replaced, and children’s bedroom furniture revamped or updated, so that the room evolves with the growing child. How do I decorate a baby’s room? When considering nursery ideas it’s advisable to plan ahead for when the baby grows. For example, painted walls are easier to update than printed wallpaper. Brightly coloured children’s wall stickers will brighten up the room, stimulate the baby’s mind, and can be easily removed. Dress the windows with children’s curtains or blinds that block out light – these can be in pastel colours or feature a printed pattern to suit the style of the room. When selecting and placing a cot and storage units, remember these may need to be moved around or replaced to make room for a bed, more spacious clothing units, and extra storage for toys and books. How do I design a teenager’s room? When the child matures into a teenager, it’s a good idea to consult with him or her before going ahead with a design. Draw inspiration from the child’s personal tastes and preferences for teenager bedroom ideas. Opt for a mature design, and ensure that personal space and needs are respected. If utilising existing furniture, this can be sanded down and varnished, or painted in a neutral colour. Consider providing a feature wall for a teenager to hang clip art. If space is available, install a study desk for the child. For the teenager that enjoys entertaining friends, how about adding a comfortable sofa? Remove toys from the room, and provide adequate shelving for books, and storage for personal belongings. 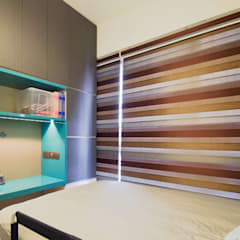 For teenage boy’s bedroom ideas consider his favourite colours. For example, textiles in earthy colours with bold accents, combined with unpainted boy’s bedroom furniture may be a fine choice. If planning on a theme, pick one that suits his favourite hobby, such as music, computer games, or sports. 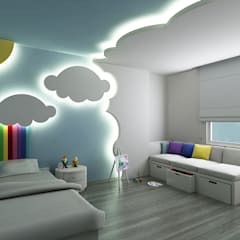 Similarly for girl’s bedroom ideas, draw inspiration from her personality. For example, a teenage girl may adore a sassy look with bold colours, decorated cushions, and stencilled girl’s bedroom furniture, or she may prefer an elegant feminine look, such as lavender walls teamed up with girl’s bedroom furniture in white, such as a dressing table. When considering kids bedroom ideas, its important to focus on creating the right setting for a children’s bedroom that will stimulate creativity and potential, encourage the child to grow with ideas, and energise him or her into activity. As well as decorating the room in a theme that appeals to the child, add other points of interest too, such as nautical themed lighting, pictures, and a pirate style wooden toy chest. For a young girl, pink or purple, may be a favourite colour. However, by incorporating additional features, such as a bed with a high headboard, draped netting, bedside lamps and a bookcase that are in keeping with a fairytale theme, the room will be transformed from a place for sleeping into a place where the child becomes immersed into a world of fantasy. Which wall colour should I use for the child’s room? 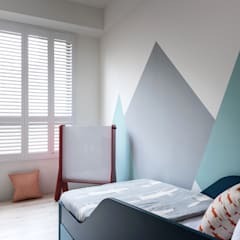 A child should feel comfortable in his or her bedroom, so it’s important to choose colours that are personal to them – or compromise if necessary. If a child prefers dark purple, this may create a gloomy effect. For a large room, a purple feature wall could be incorporated, otherwise paint the walls in a colour co-ordinating colour, such as lilac, and add accents, and textiles in purple. For an eclectic look, the use of colour has no bounds; otherwise, pick out favourite colours and co-ordinate them accordingly. For a bright airy look, choose white or pastel shades. Colour can be injected through the clever use of extra features, such as rugs, and clip art. 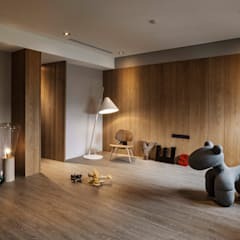 Which flooring is suitable for a child’s room? There are numerous options for flooring in a child’s room, and ultimately the best choice may be down to personal preferences. A carpet is soft on the feet, warm, and may soften the blow if a small child topples over. It is also ideal for cooler climates. However, on the downside, a carpet may become stained, and replacement can be quite involved, as all the children’s furniture from the room will need to be removed. Floorboards can be quite attractive, though they will need to be regularly painted, re-stained or varnished to maintain their appearance. Laminated flooring possesses a modern, crisp look, though can be quite cool underfoot. If opting for floorboards or laminated flooring, consider adding a rug in earthy hues, such as pink, green or beige, to achieve a warm, welcoming ambience or choose a boldly patterned rug to add a fusion of colour to the kid’s bedroom. Which décor fits my child? When choosing décor for a young child, opt for colours, accessories, and themes that they are most responsive too. This is evident by favourite books, tv programmes, games, animals, and colours. For example, a young girl that is particularly responsive to farm animals will thrive most in a room where a farmyard theme is incorporated into the design, such as a feature wall with sheep, piglet bedding, and an animal themed table lamp. If a teenager prefers the colour black, a classic style may be ideal. This can be achieved by painting the walls white and adding black accents. A few simple steps can transform a child’s room to a teenager’s room. If the bedroom is large enough, a teenager will appreciate his or her single bed being replaced for a double bed. Freshen up any painted walls with favourite colours, and revamp or replace the kid’s bedroom furniture. 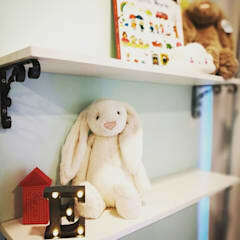 Old toys and books should be removed from the room, albeit a few favourite ones, which could be placed on a shelf to give the room a playful edge. Extra bookshelves may need to be installed as study loads increase, while toy chests may no longer be required. 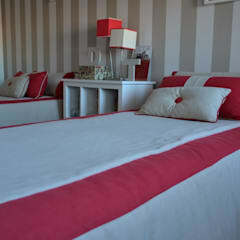 For the finishing touches, replace bedding, children’s curtains, rugs and lampshades. When designing a small room for a child, it’s essential to utilise the available space effectively. The use of colours, patterns, lighting features, and children’s furniture can create a spacious, airy effect. White, pastel colours, and subtle patterned wallpaper will make the room appear larger, while dark colours and large, bold prints will make the room appear smaller. 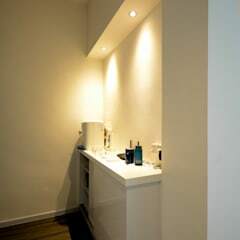 The strategic placement of a wall mirror will reflect light around the room, creating a bright, roomy effect. Avoid large pictures, and instead choose a selection of small framed prints for the wall. Opt for laminate flooring with a small bedside rug, or choose a carpet in a neutral, light colour, such as cream or beige. Windows with roller blinds have a clean, crisp look, while freeing up wall space. 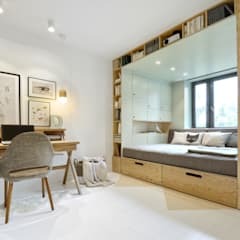 Low rise children’s cabin beds may feature drawers for clothes and shelving for toys and books, while mid or high rise children’s cabin beds may feature a built in wardrobe, a desk, and seating. Avoid a cluttered look in a small room, and opt for wall mounted shelving and storage units with doors. 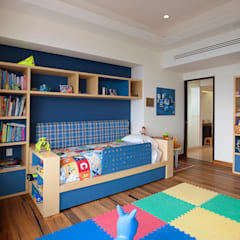 Avoid bulky kids bedroom furniture as this can overwhelm a small room. Which Style for the kids? When choosing a particular style for a child’s bedroom, remember that it is a reflection of their character and personal preferences. However, it’s also important to create harmony and balance by ensuring that the chosen style is in keeping with the rest of the home. A children’s bedroom in a classic design retains a timeless appearance that is stylish and sophisticated. To achieve a classic children’s bedroom, remember that every piece of children’s bedroom furniture, accessory, and textile must complement each other to create an elegant balance. Avoid a mix of children’s bedroom furniture in different colours and designs. Opt for neutral tones for the main wall colour, such as white or cream, and consider adding shades of grey, green, or yellow for subtle highlighting. 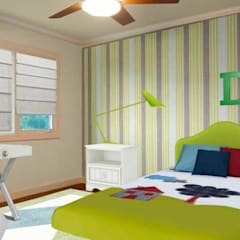 A modern style is easily adaptable, and is therefore an appealing choice for a children’s bedroom. It is elegant yet up to the minute, while creating a comfortable, relaxed environment that is neither sparse nor over-crowded with furniture. Due to the approach towards decoration – where less is more, a modern child’s bedroom is extremely easy to transform by simply replacing items around the room, such as rugs, clip art, and textiles (such as children’s curtains and bedding). For those that enjoy experimenting with colour, texture, and shapes, designing an eclectic style children’s bedroom may be the best option. Creating a room that defies conventional boundaries encourages the child to open up his or her imagination. For example, choose bedding with bold block colours, children’s curtains with a floral pattern, animal clip art, and an Aztec-style patterned rug. Children’s furniture may be painted, then decorated with stencil art. Kids bedrooms in a Scandinavian style is widely popular today. To achieve this effect, opt for earthy colours yet utilise them sparingly – allow the kids bedroom furniture and accessories to do the work. Choose simple, geometric children’s bedroom furniture in natural wood. Items around the room should be made from natural materials to create uniformity. For example, a table lamp with a concrete base would complement a Scandinavian style children’s room and also add interest. For a cosy environment, select a rug made from faux-fur.